Join Us for a Fundraising-Focused Facebook Meet-up! Who says you have to be in the same room (or even the same time zone!) to have a fundraising brainstorm? On Tuesday, June 30 at 5:15 p.m. PDT (7:15 p.m. CDT, 8:15 p.m. EDT) we’ll be logging in to host our second 2015 Facebook Meet-Up! 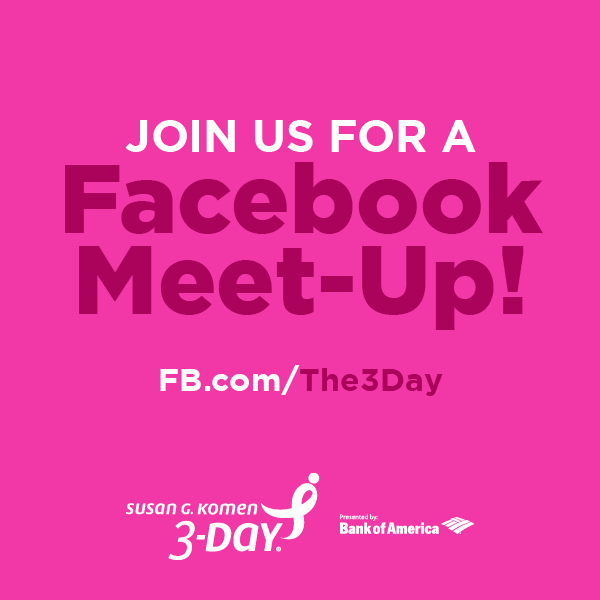 The topic du jour will be ways to maximize your fundraising for the Susan G. Komen 3-Day®. We’ll share ideas and spark conversation about how to inspire donors and stay motivated on your Komen 3-Day journey. Your 3-Day social media whiz kids, Alyssa and Erin, will be asking questions and commenting back and forth with you as “The 3-Day.” Now what fun is it if nobody chats, right? Be sure to jump in and introduce yourself to other commenters and ask and answer questions, too. You may have to occasionally refresh the Facebook page to see the most recent comments, questions, and replies. We’ll chat for an hour, and hope you’ll join us! Any questions? Let us know!